Manufactured with engineered impregnated yarns for high wear applications, i.e. size press sections and on and off machine coaters. Pre-stretched and heat set for maximum stability. Available in red, blue, green, or yellow for inside/middle/outside rope position identification. 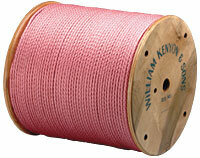 Easily spliced using the William Kenyon® basket Fid.